Upper: Light colour form, Split Solitary Island, Coffs Harbour, nthn New South Wales, February, 1987. Lower: Dark colour form, Coffs Harbour region, northern NSW, December, 1990. Photos: Bill Rudman. 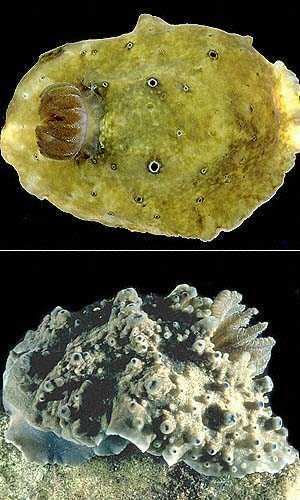 Note added 4 August 2004: Actinocyclus japonicus is considered a synonym of A. verrucosus. Two species are now recognised, the other being A. papillatus. Previously, both species were identified as A. japonicus.